I finally got around to putting together and setting up this bandsaw this weekend, and I wanted to share some initial observations. I haven't used it significantly so I won't make this an in depth review. Like any big power tool the assembly seriously benefits from a second strong set of hands (which is one of the reasons I waited so long to unbox this, that and I was busy doing other things that didn't require cutting anything). Note to manufacturers, when you are planning the packaging it wouldn't be a bad thing if some more assembly was required. 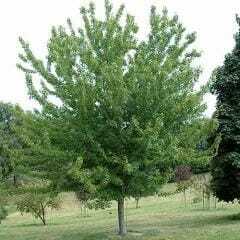 A larger number of smaller, and hence easier to assemble, pieces would be appreciated. A lifting point at the top of the machine wouldn't go unused, either. Aside from the mass, the assembly was easy. The saw mounts to the base, the cast iron table mounts to the trunnions and those are the major steps. The saw includes a blade which is already mounted and curiously shipped under tension. The box included all of the metric allen wrenches needed, except for 4 mm, but frankly if you have any power tools made this century you need a set of metric allens so pick one up next time you're at the True Value. I think including the tools was a nice gesture. The instructions were relatively clear and easy to follow (for this day and age). One suggestion I would make is to postpone mounting the table until you have set up the blade and blade guides. Although doable, it is difficult to make the lower guide adjustments from under the table, and while you will have to make these adjustments from under the table in the future, it is nice to be able to see what you are doing the first time and get familiar with the under table arrangement. Also I recommend you review the Snodgrass bandsaw setup videos before you set up your blade. I set up using the factory instructions, but I like Snodgrass' approach better, so now I get to squirm under the table a second time. By the way there is not a lot of difference, mostly where on the wheel he centers the blade. When I mounted the table I had to shift it all the way to one side to get it aligned. But it is aligned and I don't wish for more travel, so...OK. I had to file the miter slots at the leading edge of the table. There were burrs that impeded the travel of the miter gauge, certainly not a big deal, but what? they don't have files in China? The guard is intentionally able to move a little. But it then snags on this raised area of the rack and pinion housing. And also snags on this screw. Jiggling it will free the guard up, but here is a simple solution. I just put in a simple shim anchored with a piece of packaging tape. Solved both snag points. Now the guard goes up and down fine. Again this is no biggy, a simple solution with easily at hand materials, but apparently that Chinese tool box that has no files has no shims in it either. Lastly, once we had it assembled and on the Portamate mobile base it wobbled. I don't know if this was the fault of the mobile base or the machine base, but again pop in a shim and done. I think these "problems" were minor, so I am pleased with what went together this weekend. As far as performance, I cut through a two inch piece of poplar so I can attest that it will cut through two inches of poplar. Oh one other thing. It has a tensioning lever, and I have been given to understand that running a bandsaw with a detensioned blade is a badness, so I put a bicycle reflector on the tensioning handle to call my attention to its position. So I was going through the Snodgrass routine and got to thinking more about that blade guard. Although it seemed intentionally loose, there is a spring that holds the blade guard to one side, there just didn't seem to be any purpose to making it that way. Spent some time looking at the mechanism more closely and found two recessed screws in the back. Sure enough they were loose and sure enough they were 4mm allen. I guess that the factory had neither files nor 4mm allen wrenches the day they made this unit. Anyway tightening the two screws solved the problem. Took out the shim. On that blade guard... I had a similar problem with my Laguna 14-12. Although I think in my case it was the blade rubbing on the guard. I had to adjust some screws to reposition it. Maybe this is something that just kind of gets knocked loose during shipping. 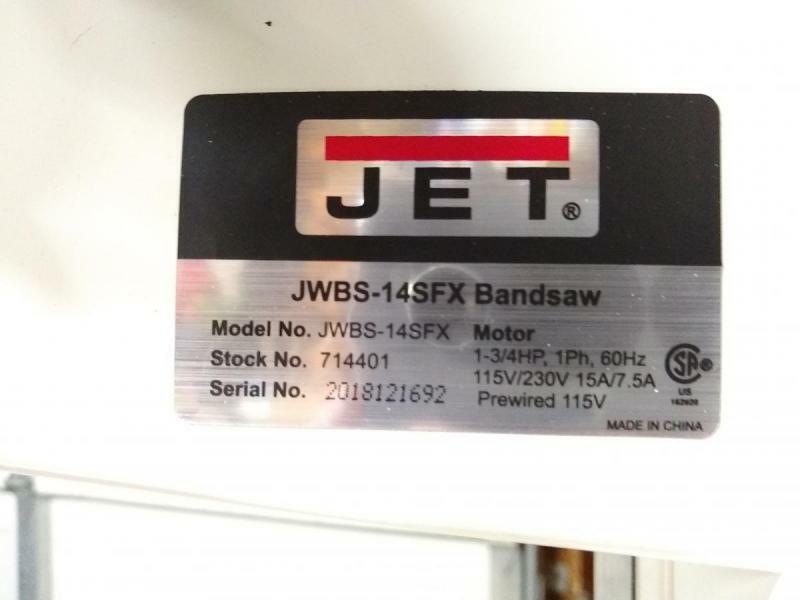 I purchased the Jet 14SFX last month and I have had the same initial findings. I too setup the bandsaw saw and used the snodgrass method to tune. The overall quality was poor from the factory. Lowering or increasing the blade height adjustment is sloppy and has enough play to where I have to make an adjustments to all upper bearing guides. 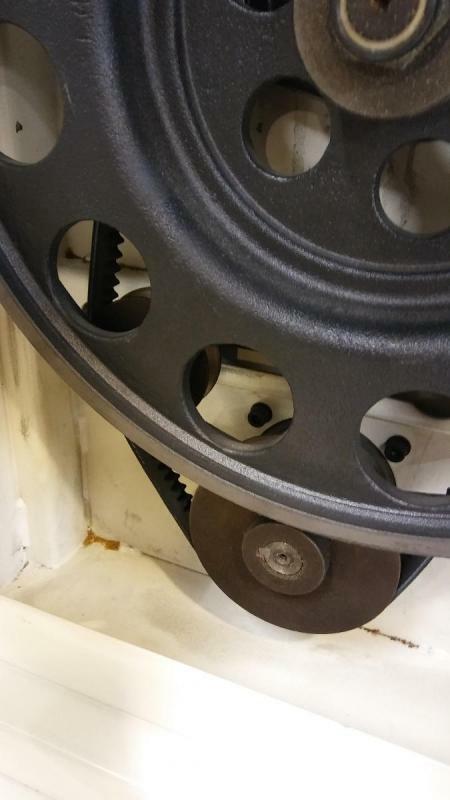 The lower wheel and motor pulley were misaligned. This led to the quick deterioration on the v-belt which came off the pulleys after about a week and half use. Dealing with Jet support was extremely frustrating. I went through their endless hoops just to prove to them what the issue was. In the end they sent me another belt, but the wrong size. I called them back and they insisted that the belt fits and there was a 3rd pulley I needed to put around it. I sent them a at the anatomy on of lower components where there was no 3rd pulley. As well as the exploded diagram of the bandsaw in the manual. Also sent them photos of the original v-belt with the correct size and what size belt it stated in the manual. I am too far about hour and half to the closest Jet Service Center. I wish I had this information before I bought it. Or really I wish I could just return it and spent the extra $100 for the Laguna. In the end I bought a link belt on Amazon just to get back up running. One more thing for a new owner is the blade tension adjustment is not capped at the end. if you turn the wheel too far the bolt keeping the tension spring in place will fall off. It will result loosing about 4 hours trying to get the top wheel off to re-assembly the tension spring. I could not get it off easily. Jet support suggested to hit the shaft with a dead blow hammer to loosen it. This worked for me. I'm not experiencing similar problems with blade and motor alignment. My upper guides maintain alignment with the blade along the full travel of the guard and the motor and pulleys seem aligned. This doesn't help you much, though. I did notice when I got down and looked that there is a third pulley in the lower section of my machine. This is the belt tensioning pulley. Mine was bought last Nov and I also noticed that Jet has changed the shape of the base since then. Mine is rectangular and the new ones are a trapezoid. So I'm wondering if the pulley thing might be a further design alteration? Thanks for pointing out the un-captured blade tensioning mechanism. I will keep an eye on that. 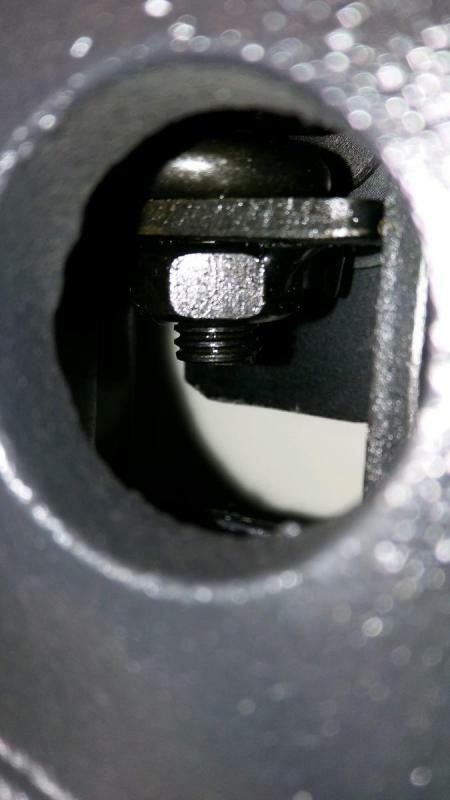 If the tension is loosened too much there is nothing to keep the threaded rod from disengaging from the nut. Just looking at my machine it seems I would have to back off the tension quite a bit though, still I've got other things to do with 4 hours. Just out of curriosity what size blade were you mounting? The saw includes a blade which is already mounted and curiously shipped under tension. This is an easy way to keep the upper wheel/assembly from slapping around during shipment. I have also received saws with foam blocks surrounding the upper wheel/assembly. Good tip on the table going on after initial alignment. When I am doing a routine maintenance on a bandsaw, pulling the table is usually third right after pulling the power and removing the blade. Unless you are running the same blade for everything, getting used to resetting the guides will come with repetition. Looks like a nice saw, fence and miter gauge. No need to upgrade right off the bat which is a plus at times. Congrats and enjoy your new tool. 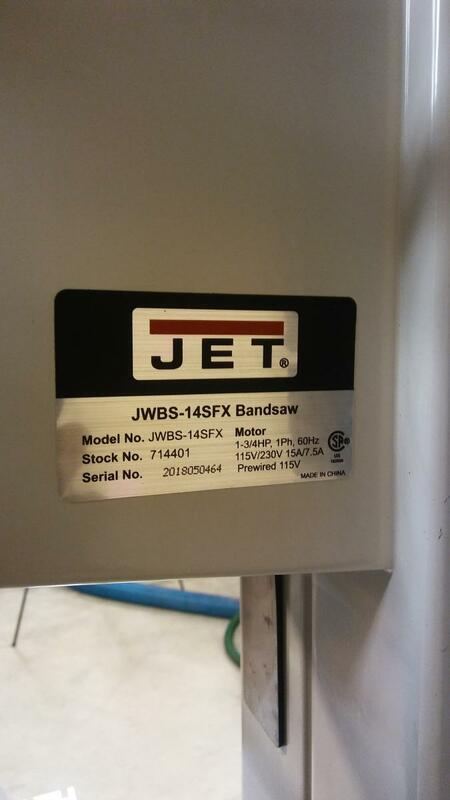 I ordered the bandsaw through my local woodcraft and it did not come with a blade. 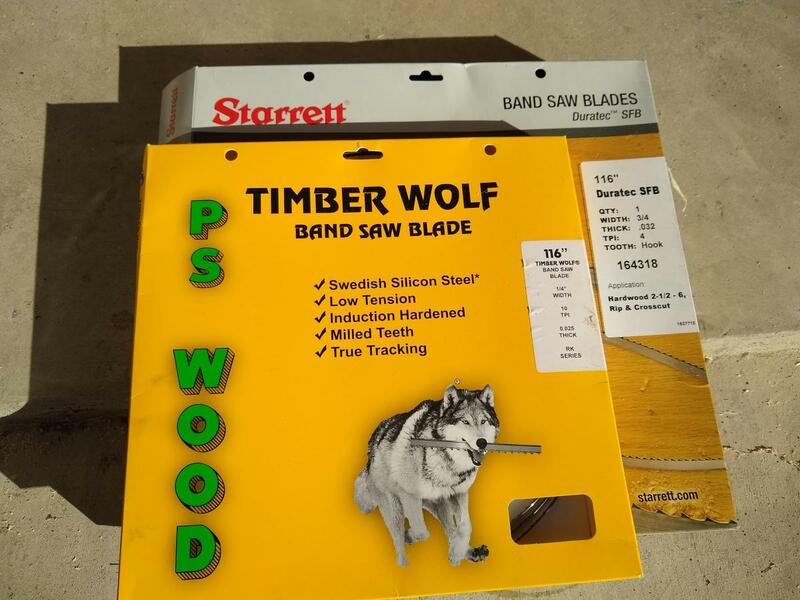 I purchased 3/4 inch Starret and 1/4 Timerwolf. I have so far only used the 3/4 inch blade. Wow! Yours does have a third pulley. There shouldn't be anything wrong with those blade sizes. They are 1/4" short, but Jet told me that was OK when I asked. Take a close look at the pictures of the saw. The photo with the lower cabinet door open clearly shows this third pulley is no longer present. In my machine the third pulley travels in a horizontal slot that you can partially see behind the wheel in my pictures. 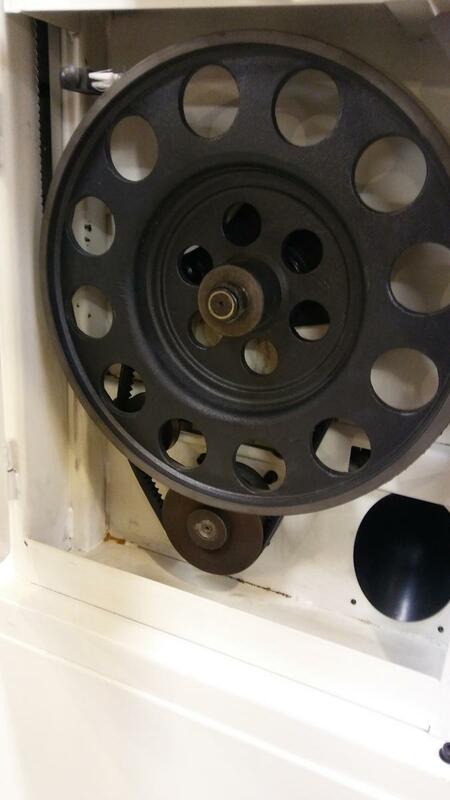 The pulley moves to the left or right to adjust tension on the drive belt, and there is a knob on the right edge of the cabinet for making this adjustment. If you don't have this pulley how is the drive belt tension adjusted? And as a further confusion some of the photos on the current web page show the same drive belt tension knob and some do not. Oddly the product manual at the current web site still says that a 5/8" x 116 1/4" blade is included, but the photographs do not show a blade on the saw. Oh and the neat video at the web page shows a saw that is so different from either my version or the current version that it has to be an entirely different model. 17"?. Looking at the serial number on my machine, it looks like at date. Possibly when it was completed in the factory. I received delivery in early march but the serial implies it is a year old(2018-12-16). It seems to me they made some significant alterations to the machine. Mark, sorry you’re having such a problem with the BS (to be read both ways). Hope you get the problems resolved. 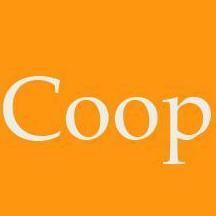 Thanks, Coop, but all's well for me now. lui_b seems to be having some difficulties.